Sign up for our free email newsletter (Good at Golf Academy). It is jam-packed with the best golf instruction insights: Including “Road to Scratch“, “Long Drive Champion Secrets“, “Consistency Blueprints“ and “The Big Lesson From the Lesson Tee“. First of all I encourage you to read the about section to learn more about the Good at Golf philosophy. Next take a look at the blog to find a lot of no-nonsense ideas to improve your long-game, short game, mental game and more. If you’re just starting out with playing golf I suggest you check out the beginner’s guide to golf. This guide will teach you some basics and get’s you up to speed so you can start with confidence. 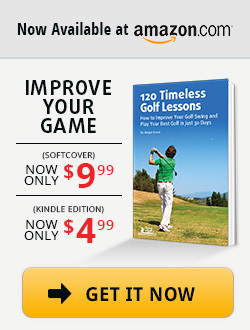 If you are a more serious player check out “120 Timeless Golf Lessons”. The book provides you with 120 effective exercises to develop all aspects of your game: Including longer and straighter shots. If you like to, you can also subscribe to the free Good at Golf newsletter for even more golf ideas. You’ll also receive a free e-book and weekly worksheets to improve your game even faster. If you find something useful don’t hesitate to share in the comments section. I’m always glad to hear from students of the game. Enjoy the game and go hit some!